Few things can help spruce up the look of an old barn than a fresh coat of paint. Before paint can be applied, however, the surface must be prepared to accept the paint. A successful exterior paint job is a time consuming process, but the results can last up to 10 years and will seal your wood and protect it from the elements, which makes it all the more important to prepare and paint the barn right the first time. A fresh coat of paint can help breathe new life into an old barn. 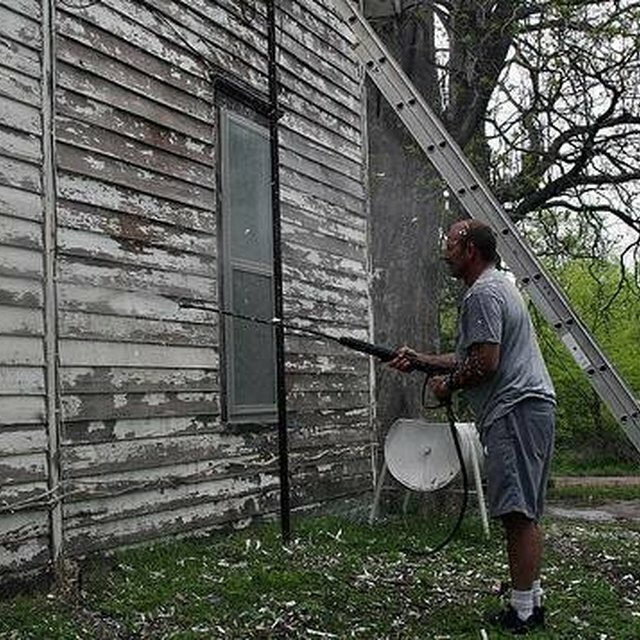 Spray the exterior of the barn with the pressure washer to remove any old paint that may be flaking or bubbling up from the wood. When you are finished spraying the entire surface that is going to be painted, inspect the surface for any remnants of flaked or bubbled paint that were not removed by the pressure washer. Let the surface dry thoroughly before moving on to Step 2. Lay a drop cloth beneath any affected areas and scrape the paint away from the wood with a paint scraper. Wear a respirator while scraping the paint to protect yourself from any dust or debris that may be kicked up during the scraping process. When you have scraped all of the old paint from the barn's surface, dispose of the paint chips in a garbage receptacle. Spray the entire surface being painted with the pressure washer a second time. Let the surface dry for two to three days and inspect the surface for any "fuzzy" looking sections. If you find a fuzzy looking section, sand it smooth with a random orbital sander. Continue to inspect and sand until there are no fuzzy areas left on the wood. Spray the paint (latex based paints work best for exterior jobs) onto the surface in large sections (roughly 10 feet-by-10 feet). Brush the paint into the wood by hand with a synthetic-bristled brush. Repeat until the entire surface of the barn is painted. To ensure you have purchased enough paint to cover your barn, use the rule that 1 gallon of paint covers about 300 to 400 square feet. For especially stubborn areas where the paint cannot be scraped off, use a paint stripper to soften the paint, then scrape it off with the paint scraper. Some old barns were painted with lead based paints. If you think your barn was painted with a lead based paint, test the paint with a lead paint test kit. If your paint is lead based, wear a respirator, gloves and disposable clothes while removing the paint, shower after every contact with the paint and do not sand the wood until all traces of the paint have been removed. Lead based paint chips are considered toxic waste and must be disposed of in an environmentally responsible manner.